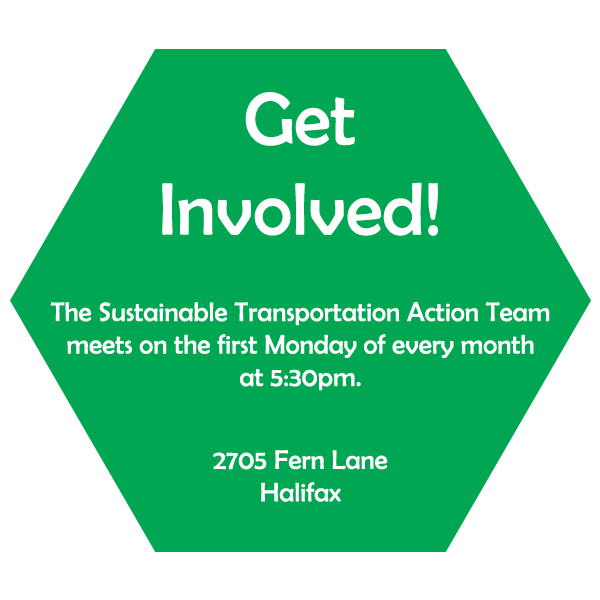 The Ecology Action Centre’s transportation team works to increase the use of transportation modes, like walking, cycling, and transit use, in Nova Scotia that reduce greenhouse gas emissions, promote healthy communities, and ensure equitable access for all. We believe in a future in which making sustainable transportation decisions is easy. Walking and biking will be safe and convenient and a culture of active living will exist. Public transit will be accessible, affordable, convenient, interconnected, and reliable. Car-sharing and long-distance transit will make it viable to not own a car. Sustainable transportation will be prioritized on all new roads. People of all ages and physical capacities will have real, sustainable, and healthy options to get to everywhere they need to go in Nova Scotia. Health: Improve wellbeing through travel, including increased safety and physical activity. Sustainability: Increase the use of transportation modes that limit emissions and waste, use renewable resources, and maintain the integrity of the ecosystem. Livability: Coordinate business, residence, density, transportation, infrastructure, and street design to foster walkable communities with local identity. Culture: Increase attitudes and behaviours that are accepting of multiple modes of transportation and streets as public space. Equity: Ensure all transportation users are provided with equitable opportunities and respect, including accessible and affordable sustainable transportation options. 1. Increase the percentage of people and goods using sustainable transportation. 2. Increase the use of community and transportation planning and design that supports sustainable transportation and people-friendly communities. 3. Increase safety in sustainable transportation.